We’d love your help. Let us know what’s wrong with this preview of Demon's Fury by Jocelynn Drake. Powerful warlock and tattoo artist Gage has managed to escape the magical Ivory Towers who terrorize the rest of humans and monsters – but at a price. Now he must join forces with his n Jocelynn Drake continues her successful urban fantasy series, Asylum Tales, with Demon’s Fury, set in a world where elves, faeries, trolls, werewolves, and vampires walk free among humanity. To ask other readers questions about Demon's Fury, please sign up. Any chance of an audiobook adaptation of book 3? Even though these are three separate installments to the series, I am going to review them as a whole because they all start right where the first left off. As some of you may know I was taken by surprise with this series when I first picked it up last year. Not only is this told entirely in the male point of view, Gage's (which is fantastic) is also a lot more rough because of it. Gage doens't hold anything back. He is who he is and you take it or you leave it. I was so excited to learn that boo Even though these are three separate installments to the series, I am going to review them as a whole because they all start right where the first left off. I was so excited to learn that book three wasn't the end of his, Trixie's and Bronx's tale because I wasn't quite ready to let go of them yet. "Trixie was my heart, but Bronx, he was my rock." It shows jut how close this friendship is and how much they love and respect each other. Which in there world is rather unique considering they are all different species. One a feared wizard, another an elf, and the third a troll. It is funny how you don't even realize how much you can miss a world, a book, a series, until you see another book is coming out and all those feelings and memories come flooding back to you. That is what happened to me with The Asylum Tales. I missed Gage and the dark gritty world that Drake created and I didn't even realize how much so until Demon's Fury was in my hands and I dived right back into the world she had created. And even if I did guess early on some of the things that were going on, I still had a fabulous time with these reads and I can't believe that then end of the third book Inner Demon is all that is left to the story. In fact, it can't be. I just won't accept it. I need to see everyone settled and safe and together again. I am keeping my fingers crossed that it wasn't the end and that Drake will once again surprise us with a fourth book or even so more shorts because I truly would love to see it happen. Demon's Fury is part I of a III part finale to the Asylum Tale's. It has been 3 months since Warlock/Tattoo Artist Gage Powell was blackmailed into working for The Tower after 10 years of being free. Gage's decision hasn't exactly been an easy one, nor is he completely free from the Towers long reach. He works alongside Gideon in order to investigate dangerous magical beings, while spying on The Tower and protecting the people from their machinations. DEMON'S FURY, DEMON'S VOW, and INNER DEMON were published as part 1,2, and 3 which was a clever idea although I got all three together so I didn't get to experience the effect and anticipation of waiting for what happens next in the final book of The Asylum Tales. DEMON'S FURY brought us back to Gage and his tattoo parlor where many unique sorts of characters come in to get a magically enhanced tattoo or two. This series has always had a whole lot of grit and character to it and nothing has changed with this last book. The big bad(s) rampaging through Low Town were pretty darn evil considering pregnant women and children were the targets so I was really interested and invested in Gage's mission to put a stop to this crazy killing. There was so much going on in this story from Gage's involvement with the towers, to Trixie's issue, Lilith and the demons, the aforementioned killers. I was shocked that this story wasn't longer. The end was odd, dissatisfying and really did not feel like an end to a series. Why you should read it: Who doesn't like an awesomely fierce tattoo artist? This series is fun to read, and each can be read as a stand-alone, though I do recommend reading them all. The whole world is very well and fully written, and I like the entire secondary cast, even the baddies. Like Dresden, I like Gage because he isn't the typical perfect hero. He's got rough edges and a bad past that keeps catching up with him. Readers (and Gage) also get a little bit of romance, and I like how book th Why you should read it: Who doesn't like an awesomely fierce tattoo artist? This series is fun to read, and each can be read as a stand-alone, though I do recommend reading them all. The whole world is very well and fully written, and I like the entire secondary cast, even the baddies. Like Dresden, I like Gage because he isn't the typical perfect hero. He's got rough edges and a bad past that keeps catching up with him. Readers (and Gage) also get a little bit of romance, and I like how book three of the Asylum Tales is broken up into three parts. The next is Demon's Vow, which comes out Oct. 21. Also, the audio version is excellent — I like how Michael Urie portrays Gage. It was my own fault, but I hadn't realised that this book was actually the first of a series which was the last of the original series - in other words, a whole lot of things had happened before the events in this book. However, the only issue with that is a personal one as I hate reading series out of order, but I really enjoyed this. It was nice to read another UF with a male protagonist and, although there were hints of Harry Dresden in Gage's personality, the world was different enough that It was my own fault, but I hadn't realised that this book was actually the first of a series which was the last of the original series - in other words, a whole lot of things had happened before the events in this book. However, the only issue with that is a personal one as I hate reading series out of order, but I really enjoyed this. It was nice to read another UF with a male protagonist and, although there were hints of Harry Dresden in Gage's personality, the world was different enough that I didn't draw too many parallels. Very disappointing. This did not go anywhere and feels like a "sample" instead of a full book. It is a tease to buy the other two in the series. It felt like a series of disjointed scenes. The only big reveal you could spot a mile away. It also suffered from the assumption of too many female authors that to write a male character you have to drop the "f" bomb frequently and make him snarly. Sigh. Why is this three books? Why? I really like the Asylum Tales, I really do. But this feels like it was rushed and should be in a longer novel. The previous two were a reasonable length. I will admit the vast majority of my problem with this, is the length. I dislike the rushed feel, and the mistakes that haven't been caught by the editor. I don't know, I love these stories, but that was an hour long for me. I officially do not like Trixie. Fans of Drake’s Asylum Tales will rejoice in the fact Drake revisits Low Town and our favorite warlock slash tattoo artist-Gage Powell. Book two, Dead Man’s Deal, left readers with a few questions as to our hero’s future. Lucky for us, this three-part collection of novellas tells us what happened after book two and what’s in store for Gage now. I have decided to review all three parts at one time in order to facilitate a clearer understanding of the storyline and it’s ultimate goal. Reluctant heroes are my kryptonite and Drake more than delivers with Gage Powell. The sole proprietor of the Asylum Tattoo Parlor and magical tattoo artist, Gage is forced to live under very strict conditions. A former apprentice warlock who didn’t agree with the cruelty of the warlock/witch community, he escaped that world only to find himself under a death sentence. His life is contingent upon his promise to never use his magic in any shape or form except for self defense. As Gage struggles to remain under their radar, his altruistic nature often places him on the path of no return. He has a strong moral compass. He will fight to his last breath to keep his friends and the world safe from injustice though his attempts to help often land him in more trouble than he can handle. At the end of Dead Man’s Deal Gage is blackmailed back into the very situation he spent years hiding from-as a guardian for the Tower-in order to save Low Town, his friends, and his brother’s life. Demon’s Fury (part one) picks up where Dead Man’s Deal left off. Gage and his former nemesis, Gideon, now work together and are charged with investigating a brutal murder steeped in magic. Gage is also contacted by a TAPPS agent to help investigate a separate series of murders that are sweeping the city. Gage is at his lowest point. He struggles to reconcile himself to being a pawn for the Tower again and decides to use his position to forewarn and forearm the residents of Low Town. He has resigned himself to being their shield should the Tower ever choose to come for them. He is also unsure of how his girlfriend, Trixie, will react when she discovers he is back with the Tower. Warlocks are forbidden to be in relationships and being with him is now even more dangerous than ever. Dark and gritty, Drake continues to build and expand her world of supernaturals who all live together; though not necessarily in harmony. Fast pacing keeps the story(s) moving at a brisk pace. Impacting action and mystery will keep you guessing as Drake introduces us to a new plot that is extremely darker than what we have seen before. Violent and unforgiving, our hero is poised to travel a path of pain, sorrow, and possible death. Dry humor continues to offset the foreshadowed bleakness. Old and new characters are brought into play, continuing to reiterate that Gage will always do what he feels is the right, regardless of the sometimes horrific consequences. Demon’s Vow (part two) eases the reader back into the story with nary a blip. Drake continues to ramp up the action and suspense as the bodies continue to pile up. The supernatural community is on edge and conducting their own investigations though no one is forthcoming with Gage. Gage is horrified to discover that the two murder investigations may be linked. He and Gideon race to stop the killer(s) before anyone else gets hurt-including his Trixie. The tension is incredible in this installment. Drake gives clues sparingly, choosing to focus on Gage and the consequences of his previous actions. His going back to work for the Towers was unavoidable but Trixie doesn’t see it that way and her actions leave me wishing that for once she would be there for Gage as he always is for her. A new character, TAPPS agent Serah Moynahan, has become a major player in a short span of time. More light is shed on Gideon and the reasons for his actions in the past concerning Gage. He is both jailor and mentor to Gage which is a difficult position for both of them. Gideon knows what Gage is capable of should he choose to continue his studies and this scares him; which it should. By the end of Demon’s Vow, readers are even less sure if Gage is capable of getting what he so richly deserves-his own happily ever after. In Inner Demon (part three) Gage pushes himself to the very edge and makes some choices that will change him though everyone is unsure exactly how fortuitous these changes will be. While searching for a way to stop the killer(s) who are cutting a bloody path through Low Town, Gage finds himself influenced by a demon whose own goals could give Gage what he’s always wanted-the destruction of the Towers. Hell is about to rain on earth and Gage is right in the middle of it. This installment left me at odds. On one hand, Drake wraps up the mystery in an action packed nail biting finale that explains everything perfectly. I found the killer(s) motivations plausible. On the other hand, while the ending resolves the main conflict, we are left with no answers towards Gage. In fact, Drake opens up a whole new storyline, gives some tantalizing clues, then walks away. Character wise, Drake continued to develop and humanize them all to an extent, often with some bittersweet results. Trixie and Gideon left me disappointed. For all the sacrifices Gage has made for them, I was dismayed to find they were not as willing for him. Especially Trixie. He was willing to give his life for hers and that if nothing else that should have proven his love and loyalty to her. Bronx is Bronx and his loyalty to Gage was as always commendable. Serah proved the biggest surprise and there is a small part of me that hopes to see her again and that she and Gage can find some common ground both professionally and romantically. I do hope Drake continues this series or at least writes an epilogue as too much is left up unanswered. Regardless of my misgivings, The Asylum Tales series as a whole is an engaging noir urban fantasy that brings to life a reluctant and imperfect hero whose need to do the right thing often leads to heartbreaking results. I honestly have no idea how to review and rate this. Then again, I had no idea what to expect when I saw the third and final Asylum Tale was split across three books. The first one was free and the other two were $1 each (Why the extremely low price point? I have no idea), so I figured 'Why not?' Surely I had one last Gage adventure left in me. So, what is this? Is the final Asylum Tale three separate, self-contained novellas that come together as a whole towards the end? Disappointingly, no. It t I honestly have no idea how to review and rate this. So, what is this? Is the final Asylum Tale three separate, self-contained novellas that come together as a whole towards the end? Disappointingly, no. It turns out this is literally one book split into three. Despite that, I found Demon's Fury's one-third of a story a little more entertaining than both Dead Man's Deal and Angel's Ink were. This is largely because the limited space constraints (this is a very short novel) demands Jocelynn Drake stay focused. There is precious little of the typical "Gage suddenly bears the weight of five thousand problems, oh woe is him, how is he to cope" and instead, we have a relatively focused--though not yet complete--noir style murder mystery. Gage is a warlock working for the Towers and he doesn't like that. He and Gideon investigate a magical disturbance and find a murder they can't solve. Pretty soon, it turns out one of Gage's tattoo artist friends mistakenly used a special tattoo to create a serial killer. Now they have to find out who it is and reverse the effects, before this person's victim count can climb even higher. It's not a fantastic premise like the previous two (It's actually pretty typical), but I think the setting is what makes it work. Magic always throws an element of the unknown and unconventional into a murder mystery. It helps that Gage's crew is a perfect fit for this sort of plot. I always loved how Gage interacted with Gideon and Bronx and that's still here, but then Jocelynn introduces Serah. I love Serah. She's driven, she's got a great sense of humor and she plays so well off of Gage. Strangely a lot better than Trixie, his own love interest, does. Unfortunately, this plot ends up going nowhere by the end. Jocelynn slams a plot twist that is entirely unrelated to the story straight into our faces, then abruptly ends the book. What do I do in this situation, Jocelynn? I know it's supposed to be three books, but that doesn't make the lack of plot development and the non-ending any less of a buzz kill. Following an epic battle brought about by the Towers where parts of the US were all but wiped off the map, Gage's loathing and distrust for the Towers, of which he was once a part of, has grown deeper and stronger. He made a vow to himself -- to stay far away from the Towers, living a low-key life as a magical tattoo artist. Unfortunately for Gage, things didn't work out the way he planned. Now working once again for the Towers alongside Gideon, he finds himself investigating a series of gruesom Following an epic battle brought about by the Towers where parts of the US were all but wiped off the map, Gage's loathing and distrust for the Towers, of which he was once a part of, has grown deeper and stronger. He made a vow to himself -- to stay far away from the Towers, living a low-key life as a magical tattoo artist. Unfortunately for Gage, things didn't work out the way he planned. Now working once again for the Towers alongside Gideon, he finds himself investigating a series of gruesome murders. Of course there's magical involvement, as this is Drake's magical Low Town, which is why the Towers have taken on this particular case. First and foremost, why Drake decided to split the final novel in to 3 parts is beyond me. Because of that little fact, the ending does end on a cliffhanger. And not a very exciting one at that, more of an abrupt ending which will be continued in the second part of this series finale. Being that this is so short, it does leave much to be desired. In this installment, I absolutely loved seeing a more human, softer side to Gideon. In previous books, Gideon was a very detached, cold professional. So much so that it instilled a deep distrust in Gage when it comes to anything Gideon. It doesn't help that he's Tower, but then again, even Gideon has his reservations when it comes to the Tower. There were also some surprising revelations concerning dear old Gideon and some of them were quite surprising. It shows an entirely different side to him, one that he certainly hid well. Gage and Gideon work well together; while they worked alongside one another in past books, it wasn't nearly enough to get a feel for their professional chemistry together. I really loved them as partners and I really wish that Drake would have paired them sooner, rather than waiting for the final Asylum's Tale to have them work side-by-side, in a friendlier manner. I received a copy of Demon's Fury in exchange for my review. Having been coerced into working for the Towers, a place he escaped when he was younger, Gage's life has changed dramatically. Still wanting to help people while working for the enemy, Gage discovers more violent and dangerous magic than he's encountered before. To add to that, Gage has been found by a TAPPS investigator, who wants his help in discovering who killed a fellow tattoo artist. While things in his professional life get hectic, Gage has to worry about the affect it will have on his relationship with Trixie and the repercussions of being a Warlock in a relationship. I really enjoyed Demon's Fury, the book definitely made me want to read more in the series. Though there are books in the series before Demon's Fury, I didn't actually feel all that lost when the story was unfolding (though reading the other books would probably have been beneficial!) and that added to my enjoyment. Though interestingly, I didn't feel that I'd missed any character development that made the story unbelievable, showing great skill on the part of the author. There were some rather gory moments of Demon's Fury, the author didn't scrimp at showing them, though I think that helped set the right tone for the book, this isn't a paranormal romance with a hint of danger, this is a much darker book (which does have a hint of romance) and I think that that worked well. There were a variety of relationships on show in Demon's Fury and I thought that that was interesting to read. There was Gage and Gideon's relationship, which I am yet to figure out other than the fact that it is complicated beyond belief. Then there was the relationship between Trixie and Gage, which left the reader with a shocker at the end, and my heart broke for the two of them. There was also the slightly antagonistic relationship between Gage and the TAPPS investigator. 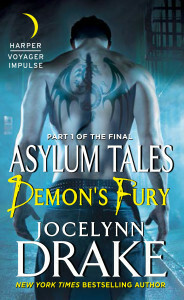 Jocelynn Drake gives her Asylum Tales series a send-off with a three part serial that begins here, with “Demon’s Fury.” It makes me sad that this is end for Gage and his crew, but at least we’re getting a real conclusion for his story. The action picks up just a couple of months after the events of Dead Man’s Deal. Gage is adjusting to life as a Guardian and trying to figure out how he is going to tell Trixie about the deal he made to survive. These few chapters introduce us to two murder cases h Jocelynn Drake gives her Asylum Tales series a send-off with a three part serial that begins here, with “Demon’s Fury.” It makes me sad that this is end for Gage and his crew, but at least we’re getting a real conclusion for his story. The action picks up just a couple of months after the events of Dead Man’s Deal. Gage is adjusting to life as a Guardian and trying to figure out how he is going to tell Trixie about the deal he made to survive. These few chapters introduce us to two murder cases he must solve: one involves a killer with a foreign magic; the other is driven to kill by a super-charged alpha-tattoo. There’s not much time to get more than our toes wet in the story. This installment is only eight chapters long. But the overall arc promises to make Gage come to terms with who and what he is. He has to figure out what kind of life he is going to live. I think the uneasy partnership with his old nemesis Gideon has the most potential here. The relationship between Gage and Trixie has always left me lukewarm and their issues don’t do much for me. But Gideon is a really interesting character; I love that he is always surprising me as Drake peels back his layers for Gage. I really don’t think this is the story to jump into the series, but for people who have read the earlier books, I don’t think you want to skip this one. And fortunately, you won’t have to wait long between installments on the serial. There is only a week’s wait between the releases. This offers a promising beginning to the end of the story. I still don't understand why the last book was split up in 3 parts instead of having 1 book cause it seems to be 1 story that continues throughout the 3 books. That didn't take away from the fact that this first part was as awesome as the rest of the series so far! The story in Demon's Fury picks up a couple of months later than Dead Man's Deal and Gage is still adjusting to the fact that he is working for the Ivory Towers. For 10 years he managed to stay away from the witches and warlocks but now I still don't understand why the last book was split up in 3 parts instead of having 1 book cause it seems to be 1 story that continues throughout the 3 books. The story in Demon's Fury picks up a couple of months later than Dead Man's Deal and Gage is still adjusting to the fact that he is working for the Ivory Towers. For 10 years he managed to stay away from the witches and warlocks but now he has no other choice than to join them again. Luckily Gideon, an experienced warlock and kinda friend, is his partner on the Ivory Towers missions, so that makes it a little easier to cope. This is a fantastic world to live in!! I haven't read any of these books from this series YET, but I am not hunting for books one and two. You'll see Gage in a wonderful light, and then he'll break your heart with the little ending. It's nonstop action, amazing world building, even without the previous books, I still felt comfortable here. Though I know I am missing something. Gage is quite the scary, yet sought after secret magical man. I am saying it like that for a reason that I won't give aw This is a fantastic world to live in!! I haven't read any of these books from this series YET, but I am not hunting for books one and two. You'll see Gage in a wonderful light, and then he'll break your heart with the little ending. It's nonstop action, amazing world building, even without the previous books, I still felt comfortable here. Though I know I am missing something. It's interesting to see Gage in this next step in his life, once again straddling the line between the 2 lives he has known. It's a good thing that the first part of this one was fun because the second part is dark and sad. I like that Gage is helping, but as he does so he is exposing a lot of himself and not in a good way. I also hate that because of Gage's nature he is about to loose something precious to him, but can see why it is happening. We'll have to keep reading to see what happens. Is this the first book in this series? I thought it was, but after I started reading it I felt like I was lost and thrown in the middle of a long tale. I'm a bit confused, and a little less intrigued than when I started. This book is a short read and quite one sided. And sometimes the story line seemed to strongly align with the investigation and other times it was just about the everyday... Again, I'm just confused. I don't think I'll be continuing this series. Good start to the third full ASYLUM TALES book. This is part 1 of 3, but all are now available since they were released weekly in October. And for anyone saying "more money" was the object? I paid $0.99 for each part. Gage is getting involved in something he shouldn't - again - and Bronx has his back. Trixie annoyed me, but that's usually my reaction to her. Good start. Interesting characters. Can't wait to read parts 2 and 3. The first third of the final, unfortunately, Asylum Tale book. Now that Gage has had his hand forced by the Towers things are changing for him and how he uses magic. Then with the killing of a fellow tattoo shop owner things start to get much more complicated. As with the previous book it was awesome! This book continues following Gage's story and the writing and storytelling is up to par with the previous installments. I'm not sure why this was broken up into 3 books with about 100 pages each. Author didn't meet her deadline? Publisher trying to maximize their returns? It's just weird, especially since the previous books in the series were full novels. It's the first book of the series that I read and it was a quick read. Although I was kind of dumped into the middle, I did enjoy the book. It REALLY made me want to read the books that come before and after! LOL. The characters do have a bit of explanation to them and the novella works just fine. Recommend! With the division of the final book into 3 novellas something's been lost. Zero chemistry between any of the players, it's almost as if the author is breaking up with her own story. Quite disappointing since I really enjoyed the first two books and all of the characters. Too bad the author decided to go this route to end the series. Gage is again in the midst of trouble but this time the price he has to pay for his involvement may be higher than he bargained for, but when is it not. First in three short stories to wrap up this edgy series and the only downside is do not have the last 2 to read yet. Book 3 of the Asylum Tales was broken into 3 parts. This is part 1.